A workshop on DEALING WITH WORKPLACE CONFLICTS was held at the Office of the Public Service Commission (PSC) on the 3rd – 7th June 2017. This was to ensure ways and skills. PSC identified this as one of the training needs required for the various Government Ministries and Corporations in the public sector. Evaluating resolution strategies and their importance in understanding lessons learnt. The training enabled participants to create networks for work harmonisation. Sila Leilua Faiva, Senior Correction Officer from SPCS delivered the thank you speech on behalf of the participants. He acknowledged with appreciation the new knowledge and skills acquired during the one week training, which they will apply in their respective work places. “Conflict is an evitable aspect of life. It is a natural dynamic when interacting with others but the more important issue is what you do with it when it occurs. When conflict is handled properly, it can add significantly to personal and organisational health. It was therefore crucial that participants were well prepared to share and apply learned tools and techniques in their daily work for effective teamwork and improved performance”. The Training was conducted by John Ross, with Kalena Sootagamalelagi Segi (Principal Training & Development Consultant) as the Co-Trainer. Soóalo Sydney Faásau, SICTP Manager, in his closing remarks thanked participants for making this training possible. 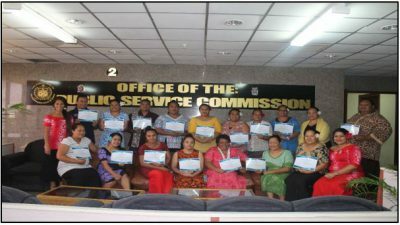 Samoa In-Country Training Programme (SICTP) courses continue to be recognised under Non Formal Learning by the Samoa Qualifications Authority. So’oalo also acknowledged the support of the Government of Samoa (Oloamanu Centre for Professional Development & Continuing Education – NUS) and the Development Partners (NZMFAT & DFAT), through the continuation of this vital Capacity Building initiative for all sectors in Samoa, under the Education Sector Support Programme (ESSP) 2015 – 2018. During certificate presentations, Sarona Esera-Filipo, ACEO of the Public Service Commission for the Human Resource and Development Division, conveyed appreciation on behalf of the Commission on the partnership between PSC and SICTP in ensuring that our people are capacity built on training needs identified. She emphasized on the importance of the applications and knowledge sharing of the learnings from this training in the workplace.